Moz reported that on average, there are 92,000 articles posted on the Internet daily. Now, it would be nice to know the breakdown per niche, otherwise that stat is not terribly useful. However, it still gives you an idea of the sheer amount of content posted on the Internet on a daily basis. And that doesn’t even include social media posts. Here are some ways to breathe some life into your content to gain more attention. A quick google search will reveal pages and pages of blog posts with recommendations, and each list seems to have the same recommendations with a few variations here and there. Write an article like 10 WordPress Plugins That Are An Absolute Waste of Server Space and explain why. While I’d probably skim over “the best WordPress plugin” post in my RSS feed, I’d be more inclined to read the “worst plugin” piece simply because it’s unique. Not only is it a refreshing change of pace from what we typically see in the blogosphere about plugins, but this type of article is sure to spark a healthy debate or discussion. Take a popular topic in your niche and spin it like I did with Are SEO Plugins Overrated in 2013? I chose that topic because I personally have found less and less value in SEO plugins so I was wondering if others felt the same way. Whether or not you agree with me, it’s different from all those redundant posts about “the best SEO plugins” — and as you can see, it got people talking! When I saw Derek Halpern’s post titled, Discounting is For Dummies – Here’s Why show up in my RSS feed, my curiosity was piqued. Derek is notorious for utilizing shock to get people’s attention in both his articles and videos. Fortunately his content also backs up his great headlines. The above title instantly conveys that if you discount your products, you’re a dummy. Whether you agree/disagree, think he went too far or not, I bet you’re wondering why he thinks discounting is for dummies. If you want to see a great example of someone standing out in a niche that some would say is “done to death”, follow Derek. Not only does he have a very animated, in-your-face way of presenting content in his videos, but instead of just blogging about online marketing, he uses the “psychology of marketing” angle to generate interest. If your approach is unique and your execution is brilliant, then you can still get away with targeting more broad topics in 2014. However, most of you need to significantly narrow down your niche by using The Google Keyword Planner or Long Tail Pro (affiliate link). I learned the importance of having a very focused niche from creating Napturally Curly in 2010. It’s so much easier to attract a targeted audience when you significantly narrow down your focus. Your conversions will be better too. For example, my email list open rate is 67% in a world where 30% is considered excellent, and anything over 50% is almost unheard of! And it make sense. I know exactly WHO my audience is. The more defined your visitor is, the easier it is to target content to them. And here’s the deal. My list is not huge by any means, but I’d rather have a small, targeted list than a large, not-so-targeted list any day! It’s easy to get caught up on numbers, but engagement matters more. Knowing what I know now, I would never create a website again that covers so much ground like this one. Going more niche is definitely best. 4. Do You Blog Too Much About Nothing? This may sound strange, but I started enjoying blogging more when I began publishing less. I know, I know. Publishing less often goes against what many marketing gurus suggest, but sometimes less is more. What I mean is a lot of people go for quantity, but quality suffers as a result. When I first started blogging, I would post 3-4 times per week. But I remember feeling stressed and skimping on quality just because I felt something had to get published. After all, quantity used to be a big part of the Google algorithm. The more content you published, the more traffic you’d receive. As long as you followed the basic SEO strategies, that was almost a given. Well, that’s not necessarily the case today. Google has shown us that if we don’t get enough quality signals pointing to our sites, they could care less about how much content we roll out. And it’s not just about Google. What about humans? You don’t want to alienate your audience by continuously producing half-baked content. Now, I’m all about creating a schedule for publishing content and setting a rhythm to build up your momentum. But that doesn’t mean you sacrifice quality for quantity. Gone are the days where you need to learn Photoshop or hire a graphic designer to create awesome images for your content. With tools like Pixlr, Canva (beta only), PicMonkey, PiktoChart and more, there’s no reason for you not to add more interesting visuals to your pages. People love to share infographics and colorful visuals that illustrate a point. Not to mention it’s much easier to read and absorb this kind of content. In my podcast interview with Cynthia Sanchez, I discussed how I often create tip-o-graphics for my natural hair site to get more shares on Pinterest. Make sure you check it out! Also, see what kinds of images get shared the most on Pinterest. Mark Trueman made use of this strategy with his article, 168 Case Studies on Generating Traffic (From 124 Experts). No doubt it took him a long time to research and organize this post, but based on the number of shares it received, it appears to have been worth it. People loved it! Not only did he choose a hot topic for his niche (traffic), but the collection of articles was so inclusive and comprehensive, you couldn’t help but spread the word. Once you’ve launched the post, take the time to notify everyone mentioned to maximize the shares. Have you ever noticed that around December of every year, you start seeing articles in your niche about what to expect in the following year? For example, Ileane of Basic Blog Tips recently published 4 Steps to Improve Your Blog for Google Updates in 2014 by Reginald Chan. There’s a reason many bloggers and Webmasters write content of this variety. They are timely and it’s human nature to wonder about what’s on the horizon. What are the trends going to be in your niche for 2014? Now’s the time to share them! Let’s face it. We’re all human and have some sort of an ego. We love to get mentions and links from other websites. C’mon! Who doesn’t love that? And we also like to let our readers know that we’ve been featured too. Many bloggers have figured this out and often use this strategy to get more traffic to their posts. That’s why people in the Internet Marketing space often create posts where they quote other bloggers like Hector did with 15 Content Marketing Tips From the Pros. You can either dig up quotes from existing posts (the hard way), or you can pick a relevant question and email it to everyone you want to quote. What is the most effective traffic building technique you’ve ever tried outside of SEO? Because Google has changed the game for everyone, we all are going to have to rely more on social media, video, email and other platforms for traffic and business. So that means the days of writing humdrum, keyword-focused content for Google are over. We saw this shift begin to happen in 2010 and 2011 when Google started heavily favoring brands and pushed down smaller business sites. The trend accelerated in 2013, and it’s only going to continue in 2014 and beyond. Forget Google. Write for humans, not bots. Use emotion, comedy, shock and story-telling to further connect with your readers. 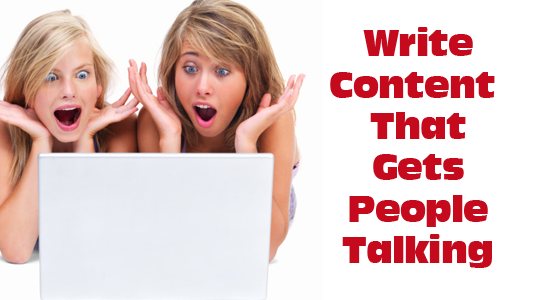 I hope these tips will help you get more eyeballs on your content. In this fast paced society, we read and skim through a lot of info and move on to the next thing without thought. Thanks for such a great post, I only have a one (1) month old blog and would like to know how to double my traffic? And how can I make every post I post be more attractive? keeping up with the competition is really hard but sometimes it makes me feels daunting to live up to the mark. visually people will get more connected i missed this point and didn’t add any pictures but i will definitely add some to my next blog post. Thanks a lot for this amazing post, now I know this will shift the way I do blog. So true. I think that part is an on-going challenge for all of us. Thank you for sharing a contents that how to improve the quality of a blog and how to increase visitors. I would like to says that, quality is the first and then other. Quality content can catch the eyes of every readers. The strategy I use is leaving the topic to the readers who would make thier own verdict on the topic. Quality over quantity is what Google is looking for. I feel many people don’t see that and as a result are losing out. Thanks for the post. Great content and Yes, for getting success in blogging, lots of hardwork, patience, and consistency is required. We have to fix our targeting audience. If our audience is not fixed, we can’t get success. Thanks for sharing these tips with us. Everyday 92 thousands of post is being published! That’s an astounding number and in such competitive business we need to do something out of the box to make a mark and you really gave us the perfect tips to do so now its our job to follow them and make a name for ourselves from the rest. Thanks for sharing this article! It is very helpful. I wondered about the “quantity v. quality” debate when blogging. So, your point of view is much appreciated. Best wishes on the book! I loved the last point and “Write for humans, not bots” because this is what i believe on. I really like your point Quote Other Bloggers. We mostly avoid to get in touch with other bloggers but when your are in to blogging then must have to stay active in blogging community. It helped me lot, as expert advice and experiences can help you a lot..! It’s been two years since I stopped blogging. Now I am getting back in the game. Things have changed a lot since, like I need training again to catch up. Thanks..this was helpful.